When I heard that Donna Downey was reviving her Inspiration Wednesday in 2015 toward the end of last year, there was no doubt I wanted to join. After watching the first video on Jan 7, I decided to watch some of her past IW videos to fill the void while waiting for the next one and was completely inspired by this one from 8.14.13. Simply gorgeous - I have always loved watching her IW videos but have yet to actually apply the techniques. Well, I am trying to remedy that this year and do more mixed media in my art journal and enjoy the process rather than being caught up in the "I'm no artist" mindset that stifles me so often. I am so glad I did. I absolutely LOVE this page. While I didn't follow her completely, for instance, I used the colors from the MFT Color Challenge and I used gelatos instead of acrylics, a different stencil, sponged on the black gesso, etc. You can definitely see the inspiration in my page and it got me creating (experimenting) in my art journal which is the point, right!? I was looking for the perfect stamp to complete my page and found this one from The Greeting Farm. It was perfect for the colors used and just a positive way to finish it off. This is very cool. I would love to do this course but not sure I have all that we need. Is it adaptable to what we have within reason? Love the colours you have chosen and your gelato work. Wow wow wow, Carisa! This is super duper rad and artsy! And I love seeing you embracing a goal to apply the techniques you've learned. Kudos to you! Yay! Love your layout. SO bright and lovely!!! This is so nice, I'm off to check out your inspiration source. Mixed media is on my wish list but I'm yet to get brave. 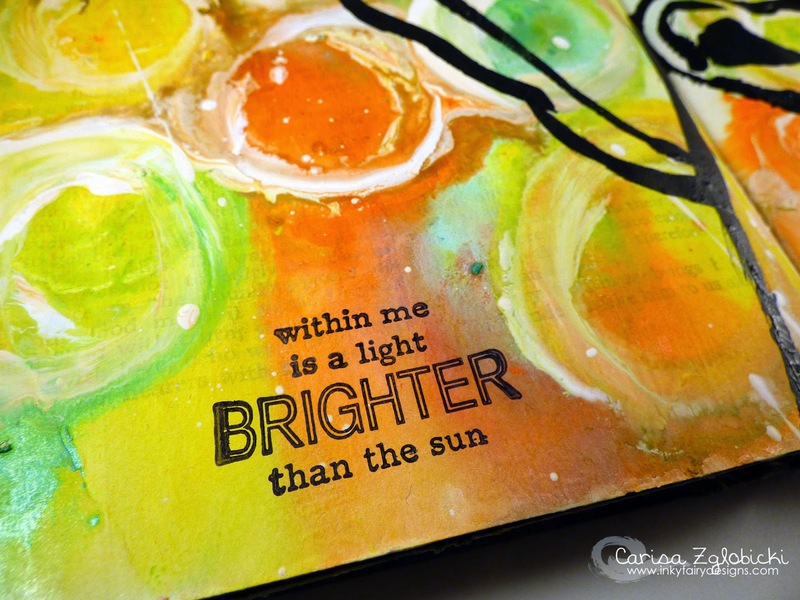 Saw you spotlighted by MFT and I love that you used gelatos! 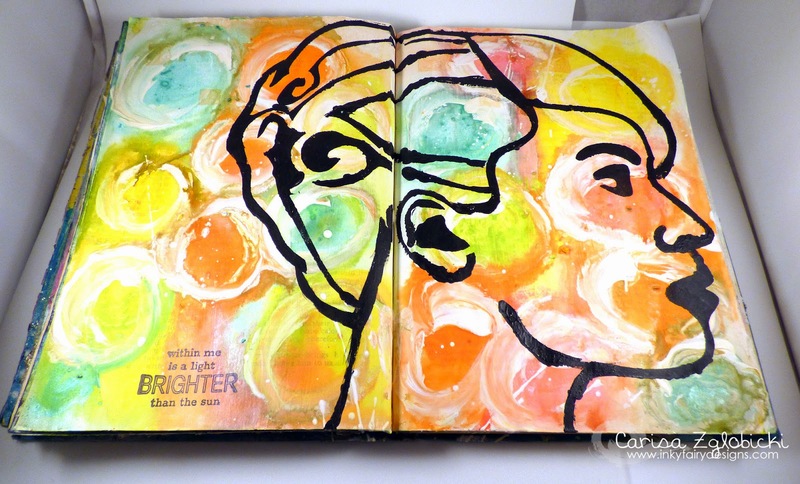 I am just getting into art journaling and before I buy all the exciting paints and things -- so tempting -- good thing it's Lent and I'm a Catholic school survivor! -- I want to use my gelatos. So your piece is just the ticket! thank you so much for your piece and I am delighted that MFT spotted you! I told them I love that they've added the spotlight blog post, I hope they keep it up and that you keep up accepting their challenges -- and maybe I'll use the color challenges as inspiration as well in my art journal. I need every kick in the pants I can get because I'm a big chicken!